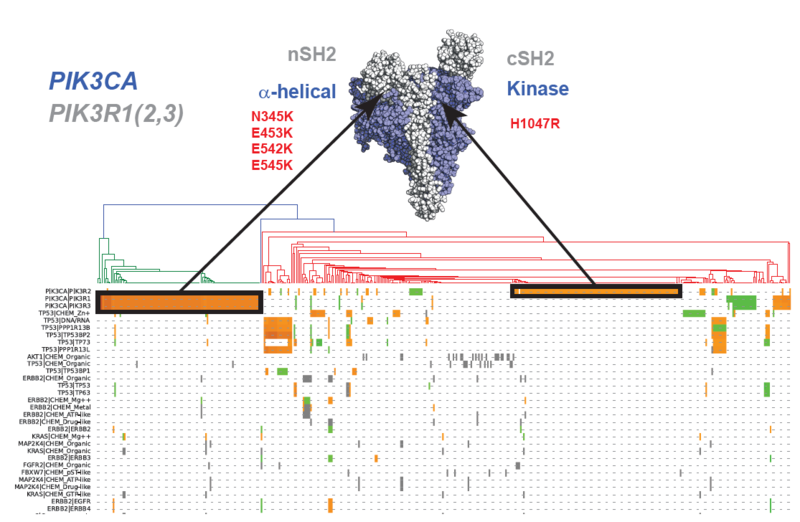 An H3K27M mimicking PRC2 inhibitor: The conserved C-terminus of CXorf67/EZHIP that resembles the properties of the H3K27M sequence. 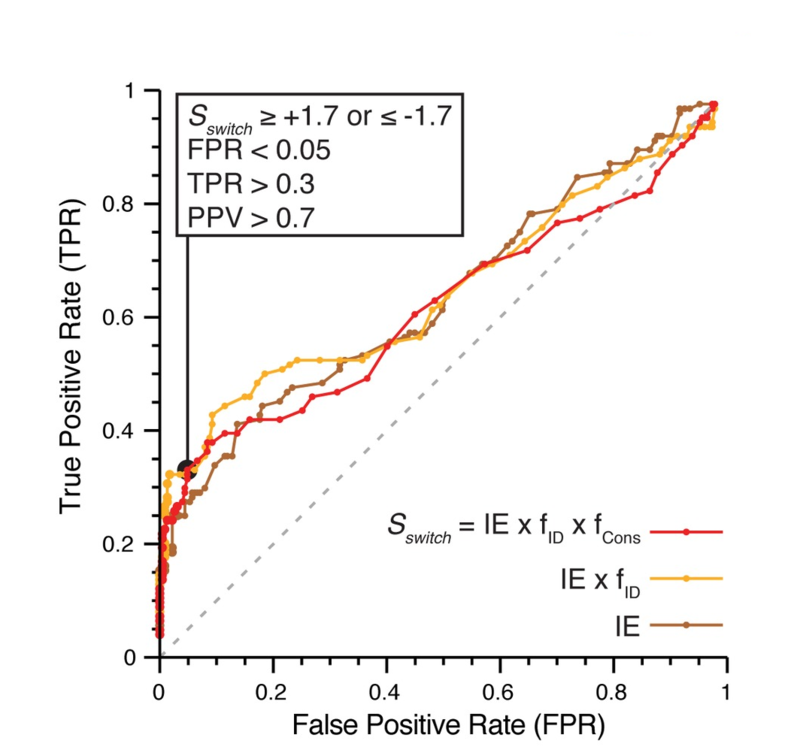 The Landscape of mutations in Burkitt Lymphoma: How two isoforms of TCF3 differ in terms of their calculated electrostatic properties. 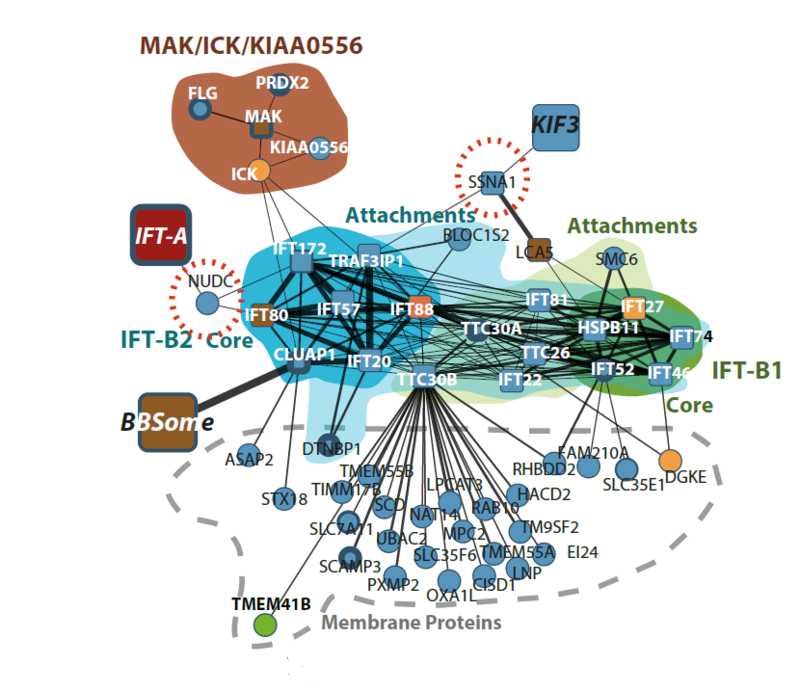 The Landscape of mutations in Burkitt Lymphoma: Model of how TCF3 interacts with both ID3 and CBFA2T3 in the context of BL. NFRKB mutations in Burkitt Lymphoma 11q aberration patients: Summary of observed mutations in NFRKB within this BL patient subset. 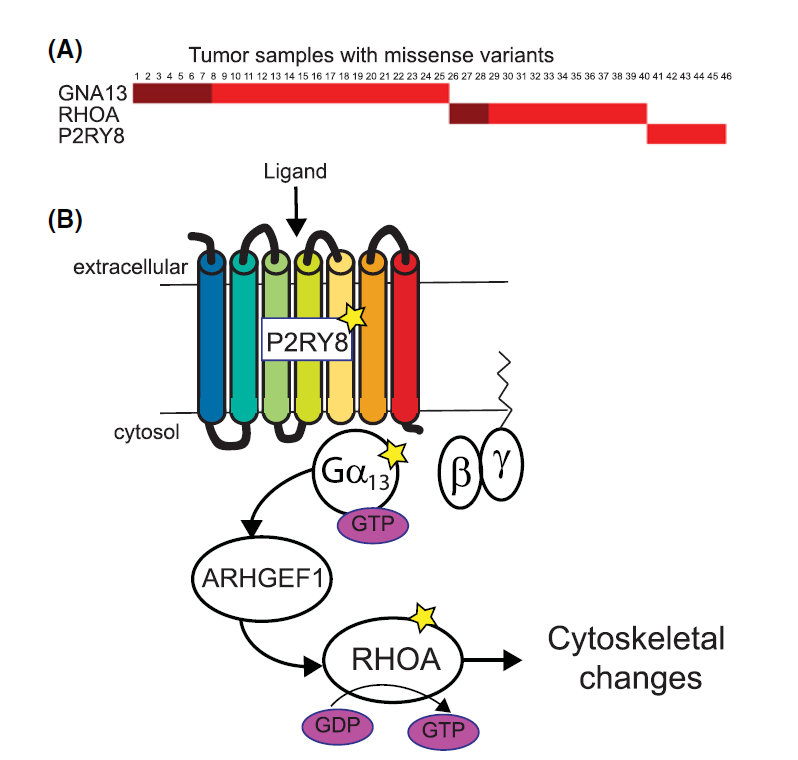 Variants affect biological mechanism: Mutually exclusive genes involved in GPCR mediated signalling in lymphoma. Cancer genetics meets mechanism: Overlapping definitions of Oncogenes, Tumor supressors (TSGs) or Fusions in the COSMIC gene census. 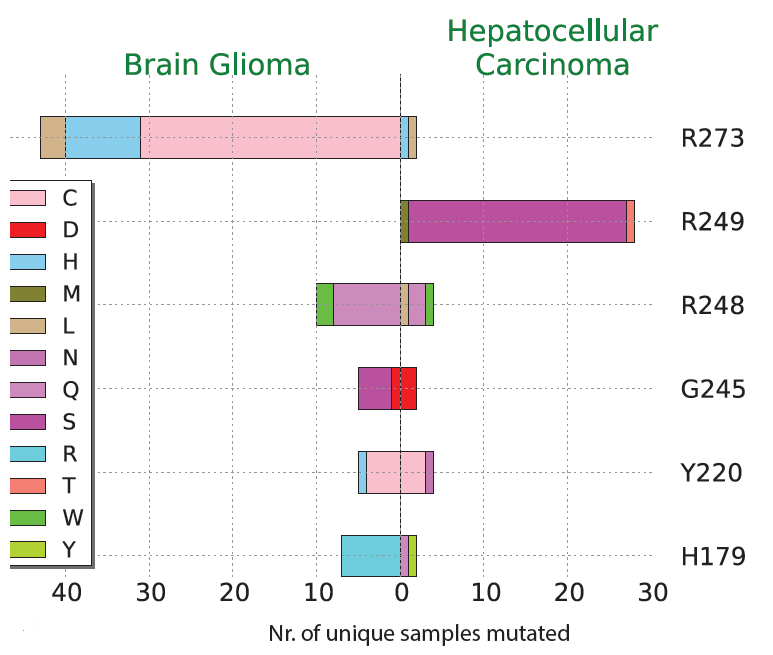 Cancer genetics meets mechanism: Examples of somatic mutations mapped to KRAS and PIK3CA. 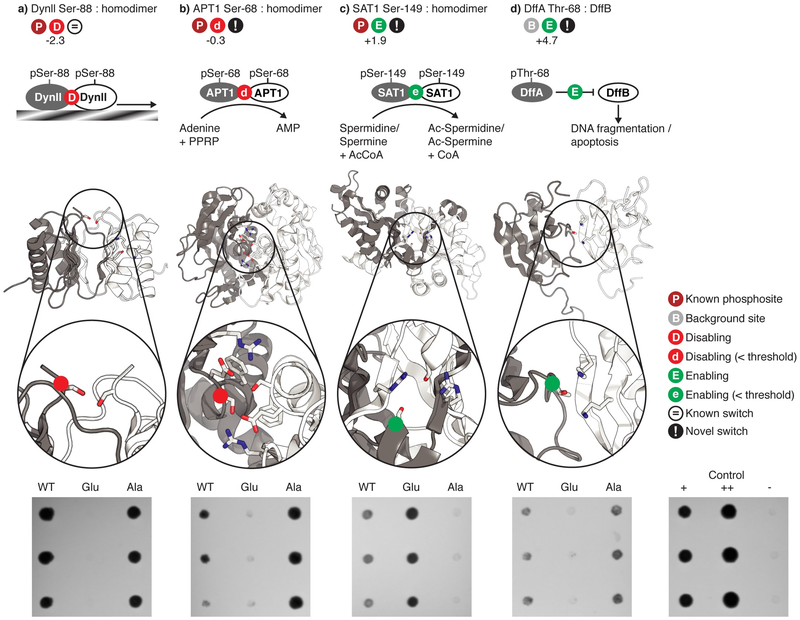 Cancer genetics meets mechanism: A Burkitt Lymphoma mutation in RHOA that appears to alter regulation by different GTPase activating (GAP) proteins. Genetic variants in cryptic choleostasis: Domain diagram showing location of genetic variants in patients suffereing from cryptic choleostsis. 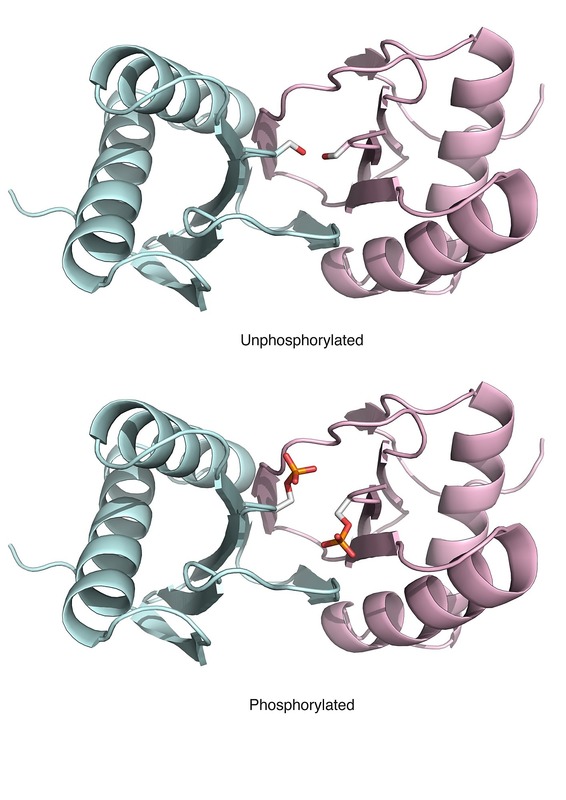 Genetic variants in cryptic choleostasis: Models of the four genes studied in patients affected by cryptic choleostsis, showing the location of the mutations. 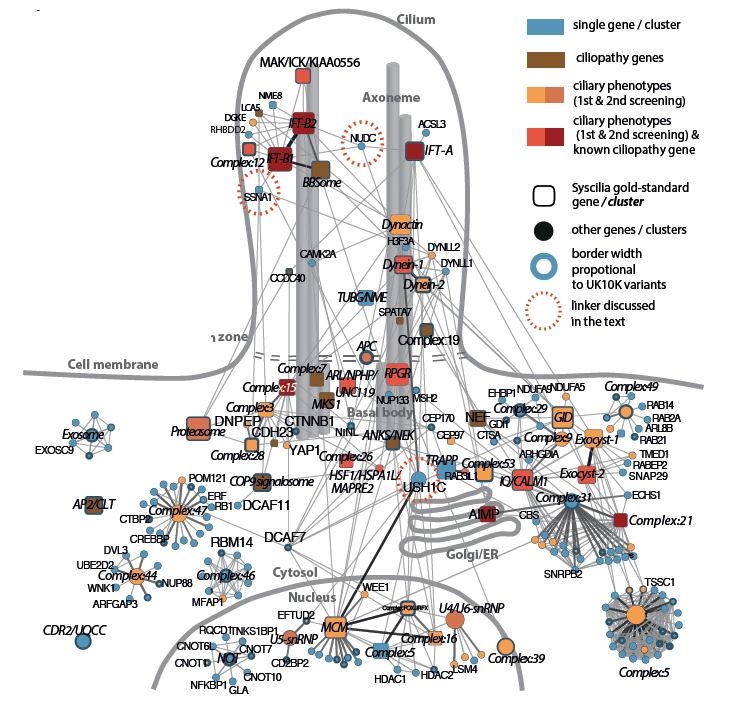 Genetic variants in cryptic choleostasis: How the mutations are distributed across genes and patients, and the associated clinical observations. 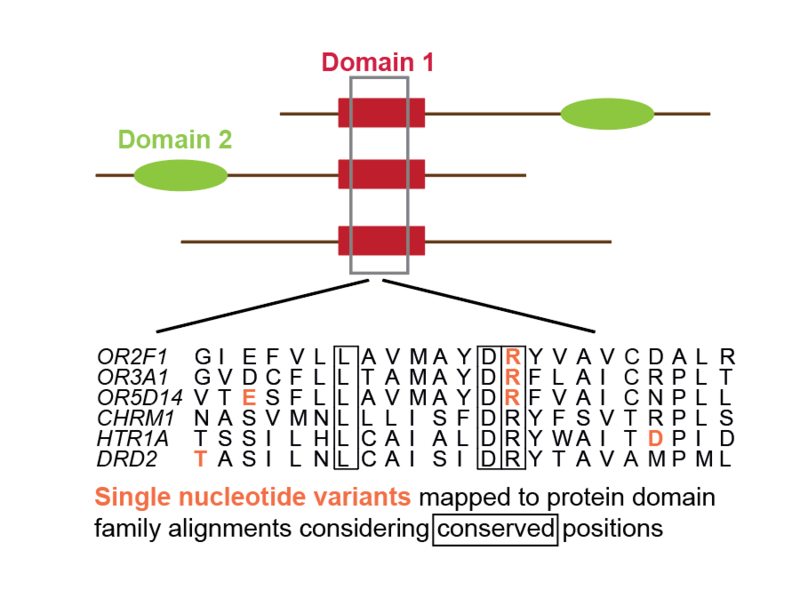 Functional genetic variants in healthy genomes: How we identified alignment positions enriched in genetic variants. 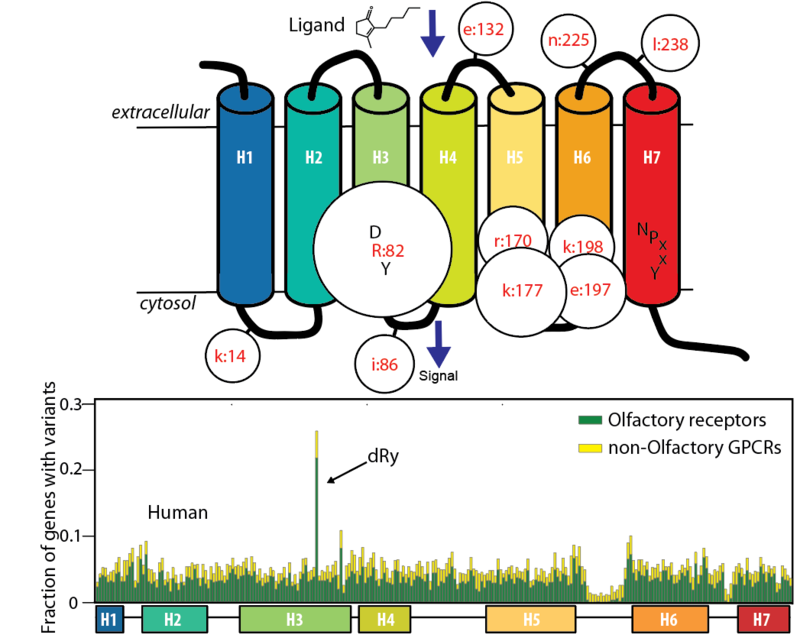 Functional genetic variants in healthy genomes: Positions in the GPCR/Olfactory receptor family with significant variant enrichment. 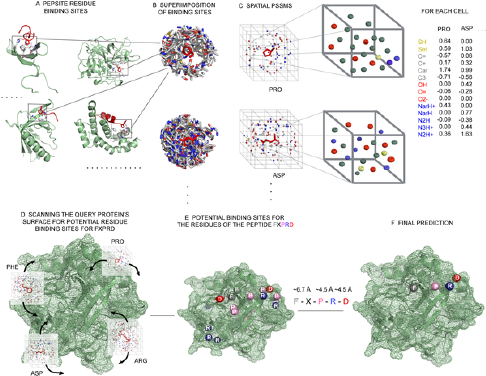 Phosphosites targeting interactions: A sample of phosphosites that we predicted to target particular protein-protein interfaces, and which were stesed using the yeast two-hybrid system. 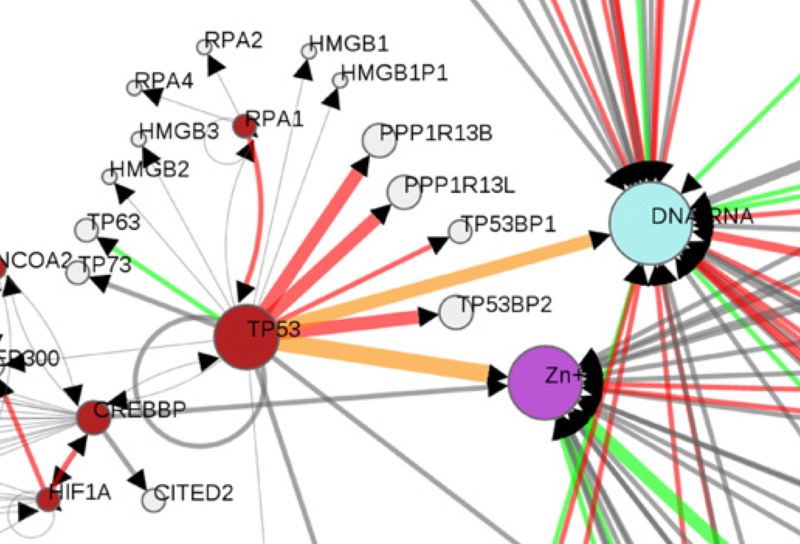 Cancer severity from interaction mechanisms: Figure shows shorter survival across all cancers for tumors with mutations altering the P53-zinc interface (red) compared to others (green). 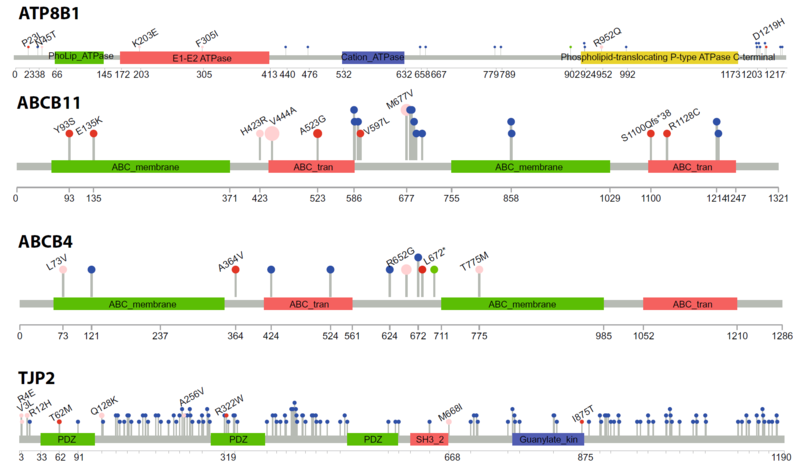 Cancer severity from interaction mechanisms: Figure shows distinct populations within Breast carcinoma according to different mutations at the PIK3CA/PIK3R1 interface. 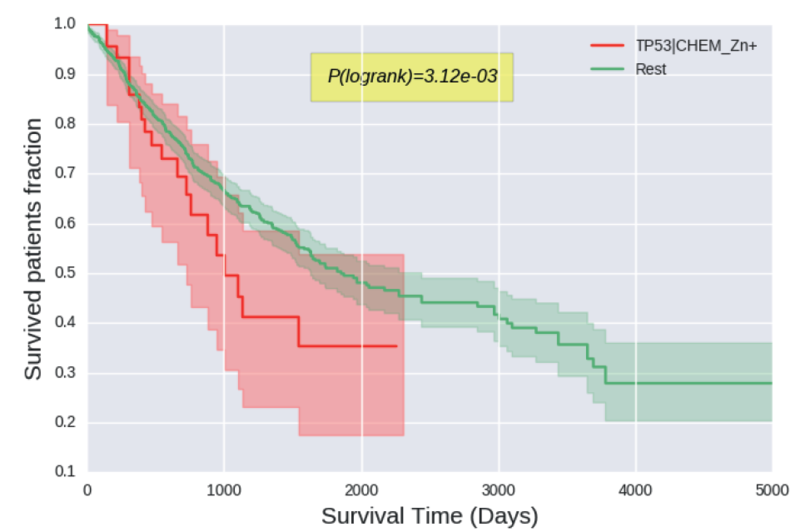 Cancer severity from interaction mechanisms: Figure shows differences in TP53 mutation preference in the two cancer shown. For example, Arginine (R) 273 is a preferred site in Brain Glioma, and the majority of changes are to Cysteine (C). 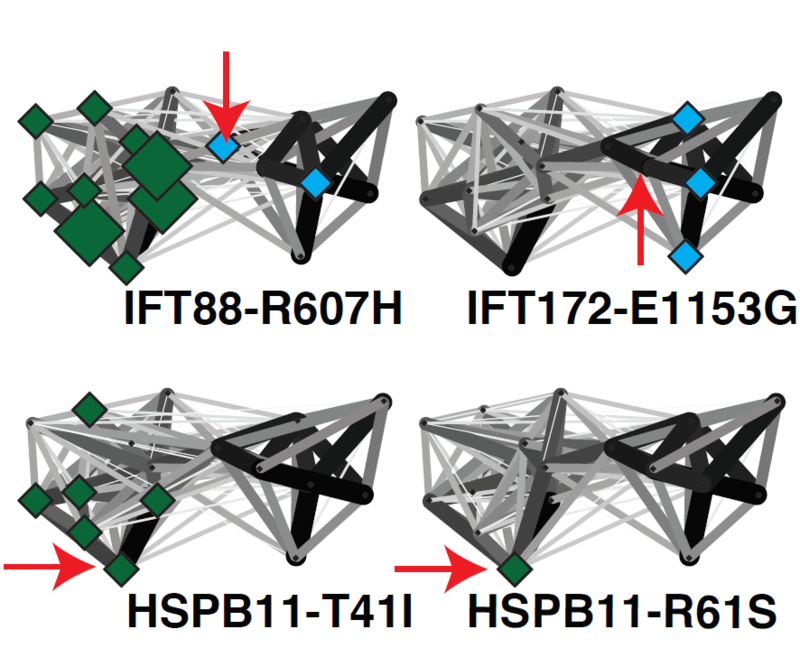 Cancer severity from interaction mechanisms: Figure shows how particular interfaces are targetted in different cancers. The size of the circle indicates how many mutations are seen, and the colour indicates whether the mutations are mostly disabling (red) or enabling (green). 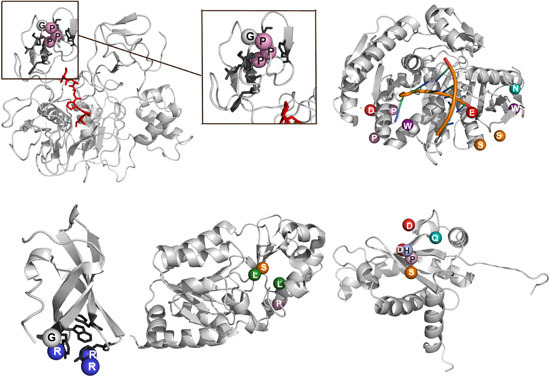 Modelling of FFV gag protein: Figure shows mutations affecting the Gag–Elp interface, central beta-sheet affect budding or Gag folding. 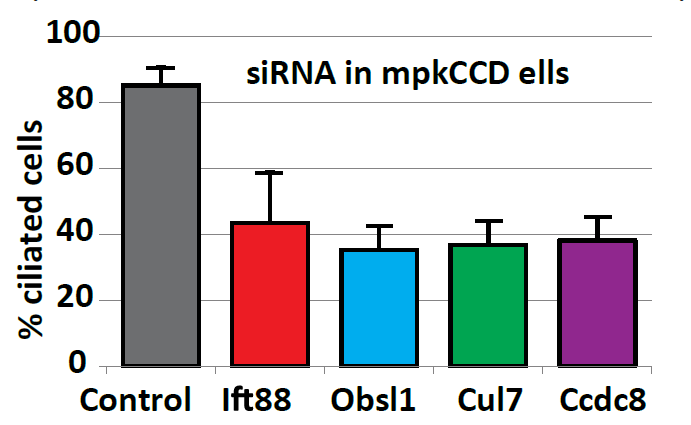 Ciliary landscape: Figure shows the effect knocking down components of proteins where mutations lead to 3M syndrome have on cilia in mpkCCD cells. We hypothesized that 3M Syndrome is a previously undescribed ciliary disease. Ciliary landscape: Figure shows the effect of variants in patients suffereing sever ciliary diseases and how they affect specific sub-complexes and interaction within the intraflagellar transport complex B.
Ciliary landscape: Figure shows the architecture of the intraflagellar transport complex B deduced by our Socioaffinity metric. 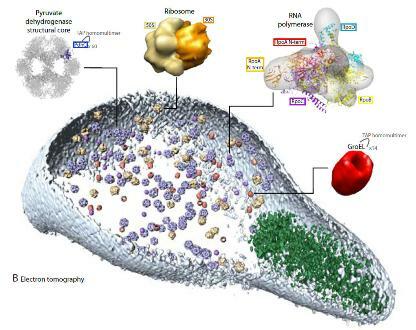 Ciliary landscape: Figure shows an overview of the complexes and interaction within the human primary cilium uncovered by Interaction Proteomics. 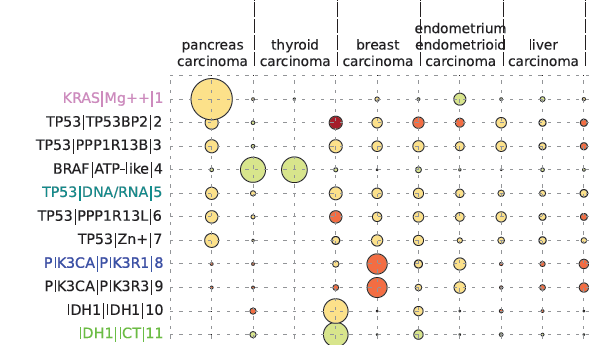 Mechismo: Figure shows a graphical representation of mutations and their effects on biomolecular interactions within Pancreatic cancer, including whether mutations enhance (green) or diminish (red) particular interactions. Generated using the Mechismo server. 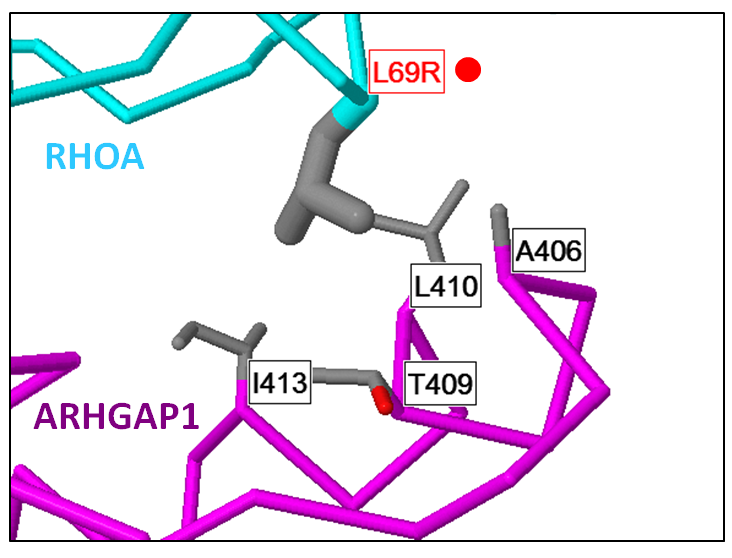 Mechismo: Figure shows an example of a mutation within RhoA (L69R) thought to enhance an interaction with ARHGAP1 within Burkitt's lymphoma. Generated using the Mechismo server. 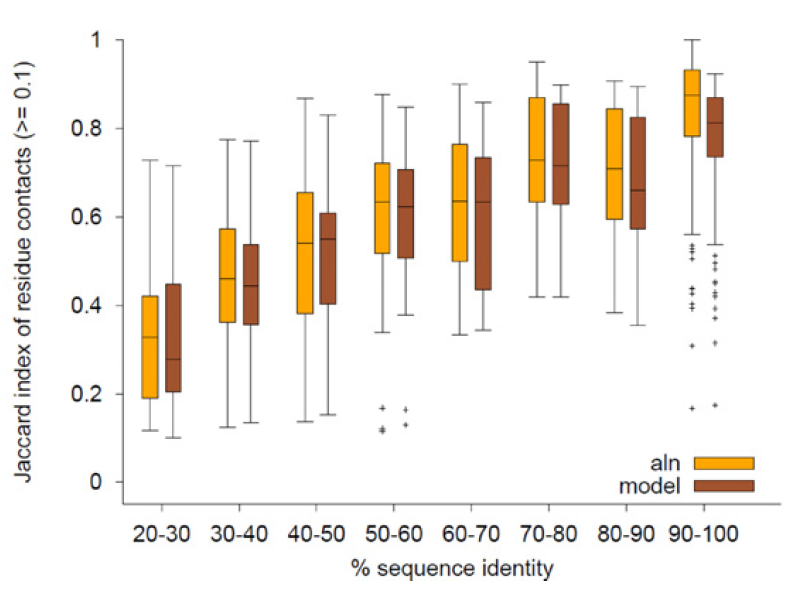 Mechismo: Figure shows a comparison of automated modelling techniques (model) to a simple strategy of looking at an alignment to template structure (aln) in terms of the fraction of residue contacts reproduced (as a function of sequence identity). 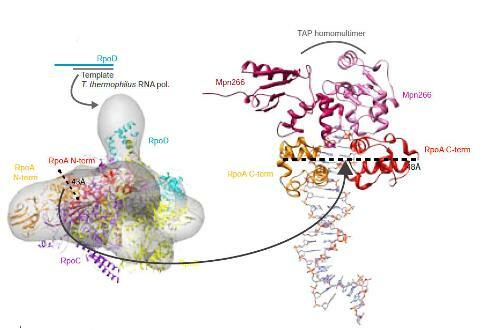 siRNA to protein-interaction mechanism: Figure shows how interactions within the IL2 signalling pathway are reproduced by the HIPPIE approach to deduece protein-interaction directionality using siRNA screen data. 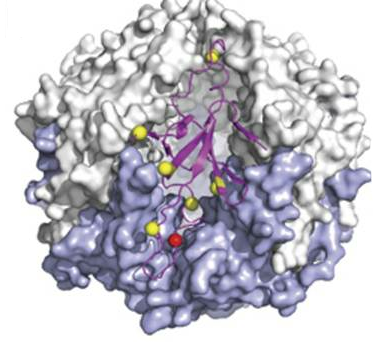 JAK3 mutations in T-cell prolymphocytic leukemia: Figure shows the location of key mutations in this cancer thought to affect JAK3 function in particular ways. 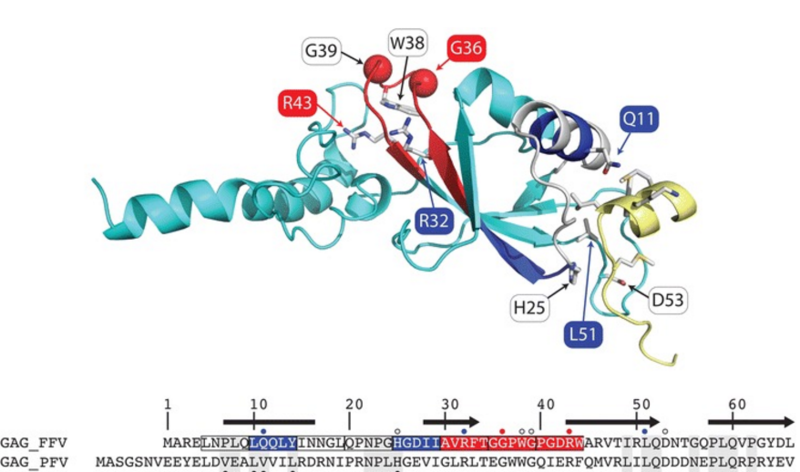 Structure of Argonaute proteins by DNA shuffling: Figure shows the location of functional regions in modesl of Ago2 and Ago3 deduced by DNA shuffling techniques. 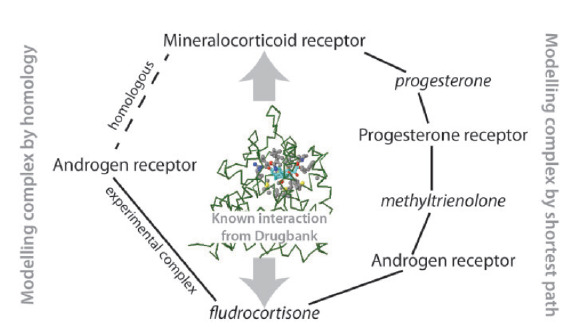 Predicting drug-protein interactions: Figure shows how our method for predicting protein-chemical interactions can link proteins and chemicals via a series of protein/chemical superimpositions. 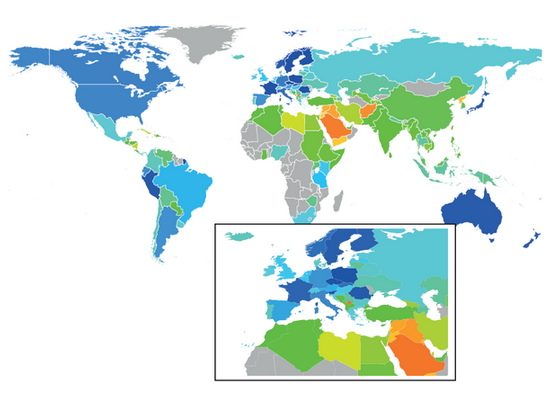 Wikipedia diputes reflect geopolitical instability: Mercator projection with countries coloured according to a dispute-index heat map (blue: few disputes; red: many disputes). 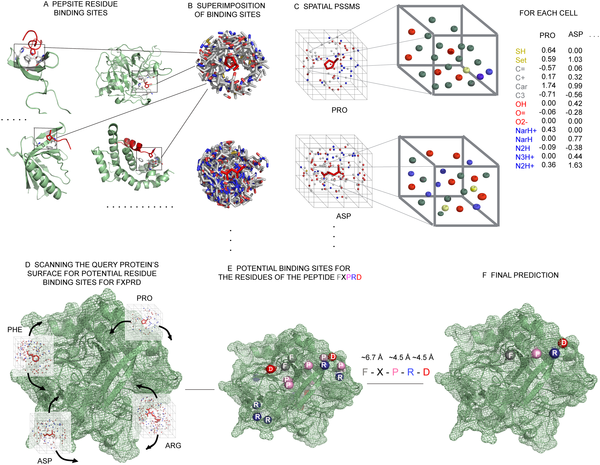 PepSite: A schematic detailing our PepSite approach for finding peptide binding sites on protein surfaces. 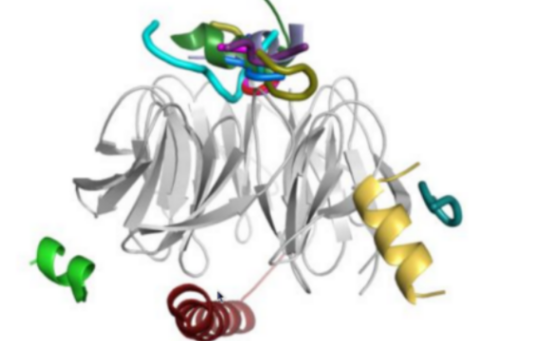 PepSite: A demonstration of some of the peptide binding sites predicted correctly using our program PepSite. Mycoplasma modelling: Figure showing how we fit our models from Mycoplasma pneumoniae into a Cryoelectron tomogram for the bacteria.